Ted Ligety grabbed GS gold Wednesday at 2014 Sochi Winter Olympics (USSA photo). 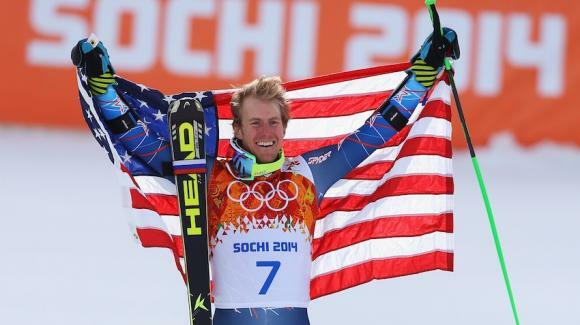 This is the one he wanted – the gold medal that mattered most to Ted Ligety. And the Park City ski-racing superstar delivered in the clutch Wednesday, winning the giant slalom at the 2014 Sochi Winter Olympics by nearly a half a second over silver-medalist Steve Missillier of France. France’s Alexi Pinturault claimed the bronze. Ligety, the back-to-back defending world champion in GS and a 20-time World Cup winner in the discipline, won a surprise gold as a 21-year-old in the combined event at the 2006 Torino Winter Olympics when teammate Bode Miller straddled a gate in the slalom. But GS is the now 29-year-old Ligety’s signature event, where he arcs smooth turns in tough conditions for massive margins of victory. On Wednesday he had a nearly one-second gap after one run at Rosa Khutor, which is a lifetime in the sport of alpine ski racing. “This one is way more meaningful than my first one. I’m not going to say my first gold medal was easy, but it came a lot easier,” said Ligety, who was immensely frustrated to leave Vancouver with no medals in 2010 and so far hadn’t raced well in super-G and super combined at Sochi. Ligety is the first American to win an Olympic gold medal in GS and the first American man to win two Olympic gold medals in alpine skiing. Phil Mahre, Bill Johnson, Tommy Moe and Miller are the only American men with one Olympic gold. Six-time Olympic medalist Miller, 36, finished 20th Wednesday, tweaking his surgically repaired knee in the first run and declaring himself done at these Winter Games after becoming the oldest medalist in alpine ski-racing history with a bronze in the super-G.
Miller, who finished second behind Ligety in a World Cup GS at Beaver Creek earlier this season, had nothing but praise for his teammate. “Ted has shown for several years that he’s the best GS skier, especially when the conditions are like this, kind of rolling and high-speed,” Miller said. “Other guys are having trouble carrying momentum the whole way down. Austria’s Marcel Hirscher, the reigning overall World Cup champion, finished fourth in GS for the second straight Olympics, but he’ll be a heavy favorite in Saturday’s slalom. Ligety can now focus on collecting his fifth season GS title, having finally collected the medal he always wanted. “It was a huge relief,” Ligety said. “I’ve been wanting to win this medal for my whole life and even more so in the last few years. All season long everybody talks about the Olympics, Olympics, Olympics. On Friday, Eagle-Vail’s Mikaela Shiffrin, a heavy favorite in the women’s slalom, will try to bring home the second American alpine skiing gold of the Sochi Games and the fifth medal overall, which would tie for the most ever by a U.S. team at the Winter Olympics.